Bernie Howgate, a self-published author who sells his books door to door, holds a copy of his latest work while working the streets of Victoria. Photograph by Chad Hipolito for the Globe and Mail. The doorbell rings. On the porch stands a lean man with a lined face framed by long, stringy hair. He looks like a skinnier, shorter version of the comedian Billy Connolly. He introduces himself in an accent betraying Yorkshire roots. 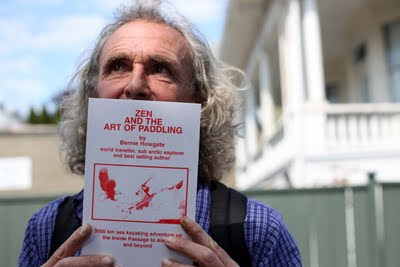 Bernie Howgate is going door to door selling his self-published book, Zen and the Art of Paddling. He begins his pitch by citing a radio interview and holds in his hands a laminated card of newspaper clippings. Mr. Howgate senses a sale is not in the works and begins to depart. I ask again for his name. He holds up the card. “I can write it down for you if you’d like,” he says in a tone midway between weary and hostile. We have not got off to a good start. Mr. Howgate has been wandering the globe as a solo traveler for more than three decades. Each outdoor adventure concludes with the writing of a memoir, which he then sells to generate funds for the next trek. He has been on the road since 1980, when a two-month bicycling holiday became an eight-year global odyssey that led to his first title, Tales of a Travelling Man. He has since cycled from Victoria across Canada on a rickshaw (Newfie or Bust), snowshoed along the forbidden Atlantic shore in winter (Journey Through Labrador), and kayaked the waters from Toronto to Goose Bay (A Lazy Day in Summer). Bernie Howgate in the 1980s. He has traversed vast expanses of this land, enjoying along the way the hospitality of strangers, such as Eric West, of Ladle Cove, on Newfoundland’s Notre Dame Bay, who once invited Mr. Howgate for supper. The peripatetic writer gained newspaper notice in 1979 when he motored the isolated Dempster Highway as part of a 20,000-kilometre continental drive in an eight-year-old car. He endured three blowouts, a broken windshield and a ruined muffler. The adventurer maintains a website on which he tells his story and offers to speak to school classes for a fee. A Toronto newspaper once witnessed his slideshow presentation to a junior middle school and praised a comic delivery reminiscent of Monty Python. The books lack in professionalism — spelling and grammatical errors abound. The writing offers an unvarnished monologue about a lonely sojourn delivered in a voice sometimes humourous, sometimes sarcastic, often ribald. A few days after he exits my porch, we meet at an unpretentious pub on Cook Street in mid-afternoon. If he recognizes me, he does not let on. He has been pounding the street for hours, as he does seven days a week. He finds Victorians to be reserved and so polite about not buying a book that he loses precious time waiting for the formal rejection, a proposition that bothers him not in the least. “I’m old enough. I’m not going to burst into tears,” he said. The sound of his homeland is still on his tongue, though he has lived in Canada for nearly four decades. The son of a cook and textile worker of Irish ancestry from Birkenshaw, West Yorkshire, he came to Canada as a young man, finding work as a design draftsman for an engineering firm in Toronto. He soon after hit the road and has not ever left. Mr. Howgate, 62, wears a crisp, clean shirt and carries his books and his laminated clippings in a backpack. He drives a dusty Chevrolet Suburban, joining other sojourners along the Wal-Mart trail, where vast parking lots offer inexpensive accommodation. His itinerary this month includes a circle route from Victoria to Nanaimo, Comox, Powell River and Vancouver. First, though, this book tinker revisited a promising street in Victoria’s Gonzales neighbourhood. He unwittingly returned to a house where he had earlier been unsuccessful. The second visit was, improbably, even less fruitful.